Wheat germ, coconut, honey and soy whipped cream. Another vegan dessert, too. For some thoughts on wheat germ and refined flour, check out the discussion of Bran from the Joplin, Missouri bran muffins card. From a box sold in Chicago, Illinois. Combine sugar, salt, oil, cream, vanilla, and honey and beat well. 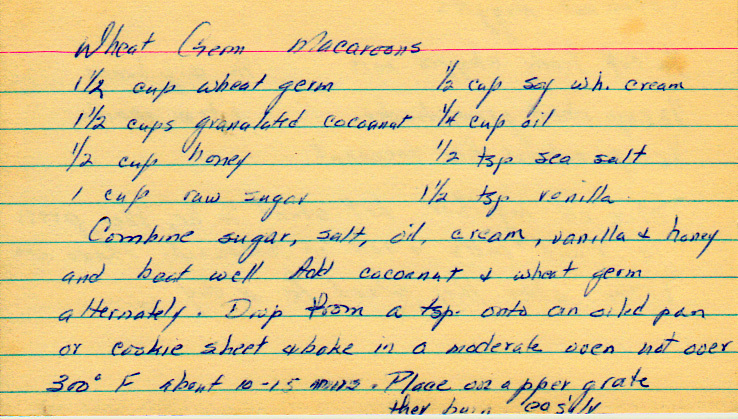 Add coconut and wheat germ alternately. Drop form a tsp. onto an oiled pan or cookie sheet and bake in a moderate oven not over 300 deg. F. about 10-15 mins. Place on upper grate.